My need for a compressor wasn't the usual reason (music production), but for more general purpose video production. We film live events where, at times, the audience response can be much louder than the performers (whether that be recording something in a theatre, or a football match). And either you under-record to avoid horrible distortions when they cheer and whistle, or you try (and usually fail) to drop the volume down fast enough when people start to cheer, attempting to avoid being over-driven. And under-recording still leaves you with audience usually being too much louder than performance, on the whole, so the viewer turns up their volume, then gets their eardrums blasted by the audience responses. So, all we really needed was a simple stereo limiter, but a compressor would be slightly better, as you can have a softer knee before limiting comes into effect, and you can use it to get a more consistent volume level, in a situation where that sort of thing is actually desirable (unlike the music loudness wars, or pop music without any dynamic expression). In my industry, there are at least three basic uses for a compressor, and this unit can do at least two of them simultaneously: Aggressive regulation of the normal sound level (e.g. forcing dialogue to be at a certain sound level, with very little deviation). Regulation of excessive audio levels (e.g. compressing audio going above normal levels so that it does not go over by as much, while still allowing audio to go somewhat above normal). Limiting of extreme audio input levels so they cannot exceeed a specific output level. And it's the last two that would be my prime concerns in any production where there was an audio mixer live-mixing (they'll handle normal audio levels, the machine will take care of nasty surprises). But for jobs where you don't have an audio mixer there's a benefit in using it to automatically regulate the normal audio levels. I was faced with building my own (do-able but convoluted), or buying something ready-made, when I spotted this device. They go for around $200 (Australian), which would be similar to how much I'd have to spend to build one neatly (box and parts, never mind the construction time), and I'd have a difficult task shoehorning everything into a 1RU box, myself, particularly the power transformer. And, of course, there would be the experimenting of the design versus actual working device, and it wouldn't be as fancy-featured as theirs. This is a dual-channel gate/expander, compressor, and limiter. It can operate as two independent audio processors, or they can be tied together as a stereo processor. In the stereo mode, the two input sources are jointly sampled to provide the processing control signals which will applied to both of them. i.e. The mono sum of the left and right side-chain inputs, process the left and right outputs by the same amounts in tandem (gating, expansion, compression, and limiting—though, I think, limiting is controlled from the output, backwards). And it does so (controlling both channels together, when in coupled mode), whether the side-chain is a separate signal, or derived from the main inputs, or a combination (if nothing is patched into a side-channel input socket, the main input signal is piped through). All the variable controls are clicky-detented pots, which supposedly would make it easier to dial up the same values again and again, or on both channels, but manages to make it harder to precisely adjust things like the output levels (when the pot doesn't want to stay on the edge of a detent position). Except for the unilluminated power switch, all the control buttons light up to show their mode. When in stereo combined mode, there's a confusing mixture of controls which affect both channels together, and some that are independent. In combined mode, on each side, you can independently switch between internal or external side channel sources, switch off the low cut filter to the side-chain, the tube sound emulator, all the de-esser controls (on/off, level, and operating frequency). And the common controls—all set from the channel one side—are all of the expander controls, compressor threshold, ratio, attack time, release time, hard/soft compression knee, dynamic enchancer, output gain, and peak limiter. There's one or two switches that are nonsensically labelled. There's a switch to set the expander/gate release time to fast or slow, but it's not labelled whether you press it in or out to select fast or slow speed (pressed-in is slow release). And the input/output metering switch is pressed in to measure the output, or popped out to measure the input. It ought to be the other way around, so the button worked in a logical manner (their manual claimed it worked that way, but it doesn't). There's no block diagram, so you have to work out the signal flow through the unit, for yourself. Though I've worked out a diagram, and put it further down on this page. It doesn't come with a manual. This can't really be for paper-saving reasons, as it comes with an introductory booklet which has more pages than the manual (albeit, that it's multi-lingual), and a glossy magazine-like catalogue of their other products. While I can see reason for offering on-line documents for the sake of being able to provide the most up-to-date and error-free version, give me a manual and let me look for a better one if I feel the need. And while I'm griping about manuals, this downloaded one is for three similar products, so you've got to mentally ignore the bits that apply to other models, and work out which bits apply to yours. There are a couple of very similar models of two-channel compressors, with the only obvious differences between them being that on one unit you can only switch on or off some features, and have variable controls for some other features, and the other model has almost the opposite (for those same features, the type of controls were the opposite kind). And there's another model with four audio channels, and far less features per channel. If you're going down the route of electronic documents, make it device-specific, or write it better. e.g. Instead of having the same, but differently controlled, features across different models spread about the page, group them together (put one model at the start of the manual, then the next model as a new chapter). It would appear that a major part of this unit's design, is that it's a dual compressor, where both units can be coupled together for stereo audio. Oddly, some controls (tube emulator on/off; and the de-esser on/off, male/female voice pitch selection, and level) require separate adjustment on each channel, where you'd expect them to be controlled by the same amount on each side, with one set of controls. After all, if you were doing stereo audio processing, would you really try to fake the distortions of a tube compressor on only the left side of the audio? I'm inclined to think that it would have better to have a dual-channel unit where there only were one set of controls for all the combined features, and only have individual controls where it was necessary (such as adjusting the right audio output level to match the left), and letting us have full variable controls on all features, rather than simple on/off switches. And, perhaps, likewise to have a single-channel model, where one rack unit only handled one audio channel, and gave you variable controls on all features. Because, for either single or dual channel purposes, it's nicer to be able to control how much dynamic enhancement there is, rather than just bung on too much or too little, likewise with the de-esser, and being able to control the ratio of the expander, etc. One thing I would really pick on is the sharp corners on the front panel, and particularly the rack-mounting ears. You could get some nasty cuts carrying this unit, or while mounting it in a rack. And if you thought you might simply take off the rack ears, because you were going to use the unit free-standing without a rack, you shouldn't. If you remove the rack mount ears, it leaves gaping holes in the sides of the chassis, exposing the electronics to damage from intruding conductive material, and allowing contact with the terminals of the mains power switch. It is a cheap(ish) product, one that's quite likely to be bought by home users who don't have a 19″ rack to mount it in, so it will be used as a freestanding device by a lot of people. The rear panel comes with separate input and output connectors for everything, it doesn't use shared input/output side-chain jacks, so you don't need any special break-out leads. It has parallel-wired balanced XLR and ¼” TRS jacks for the inputs, likewise for the outputs, with a +4 dBu/−10 dBV switch for each channel, that simultaneously sets input and output levels. Whereas the side-chain connectors are unbalanced ¼” TS jacks, with no level controls. And it plugs directly into mains, the power supply is internal. Signal ground is directly connected to chassis, and mains earth. I might have wished for something more flexible than those two choices of input/output levels, I have different equipment with −20 dBu, −10 dBV, −6 dBu, 0 dBu, +4 dBu, and +8 dBm input/output levels to contend with, and the unit's input stage begins to clip at 18 dB above nominal (the manual reckons it handles a few dB more, but it doesn't). And 18 dB input level peaks, or more, above nominal can easily be encounted with some source material. So, either including a middle step between the two extreme signal levels, or a variable pot, would have been nice. It would have been nice if the side-chain inputs, at least, had an input level control. And if its inputs and outputs were balanced, too. I do have one mixer where all audio signals are balanced, and some parts of it don't like having one leg of the balanced signal being grounded. Upon later examination of a couple of units, and a circuit diagram, it appears that the unbalanced ¼″ jacks use impedance balancing (even though the manuals don't mention it). What that means is that although there is only one actively driven connection, the other leg has a passive resistor to ground of equivelent impedance. This may aid things in connecting to balanced equipment, but I wouldn't expect a very good CMMR. Both channels look identical. When coupled together, the common controls are done on the left side—it becomes the master. The switchable gate or expander has a variable threshold, some uncontrollable automatically determined undisclosed preset attack time, and a fast or slow release time. The compressor has the usual threshold, ratio, attack time, release time, and make-up gain variable controls, with a switch for automatic attack and release times derived from some kind of assessment of the signal that's really just a preset attack and release times (according to a schematic that I downloaded, there isn't any circuitry that could do any kind of automatic signal assessing). And a switch for compression to start with a hard or soft knee. There's some sort of tube emulator, which effects the harmonics of the distortion caused by compression (sounded like someone turned up a mid-treble control, a bit, to me). There's a dynamic enchancer, which causes the treble to be somewhat less compressed than the rest of the frequency range (some uncompressed audio from the input signal, at mid-high frequencies, is mixed-in with the compressed output). And a full-bypass switch, which bypasses all processing of the audio (expander/gate, compressor, limiter, everything), using a relay changeover circuit that directly connects the main input and output connectors together. When powered off, that relay automatically falls into the bypass mode, so that audio path is not interrupted. The side-chain has an internal/external switch (internal being derived from the main inputs), and a side-chain monitor switch (where you can hear the side-chain signal go out the main outputs). The internal side-chain audio is fed to rear-panel output sockets, allowing you to do external processing of the side-chain (such as equalising, or fancier processing, such as externally delayed audio fed through the processor, with undelayed audio fed into the side-chain). There's a low-cut switch for the side-chain, to minimise pumping effects from strong bass (not that I've managed to hear it do anything, but I didn't have any subsonic audio to test with). And a de-esser which adds a variable amount of treble boost to the side-chain signal, with a pot for the amount of boost, and a switch to change the frequency range to favour male or female voices. After the compressor section is a variable control for the peak limiter. I don't recall finding any documentation that stated whether the compressor used peak or RMS detection, but it's rather obvious that the peak limiter does use peak detection, and I think this is the right choice (I want to use it to stop nasty clipping, rather than use it merely as a sound level control). Block diagram of the MDX2600 compressor, derived by examination and studying its circuit digram. The side-chain is derived either from the main audio input signal, or a separate input (you have a selector switch, and the jack is switched so that the main input will be used if nothing is plugged into the external side-chain input socket). A small amount of low-cut can be applied to this side-chain, with the “contour” switch, to limit low bass from creating a pumping effect (though I can't detect any obvious change in normal operation, only with a tone generator, of about 6 dB around mains hum frequencies). The De-Esser can add a variable amount of treble boost (you have a level control, and a male/female frequency switch), to the side-chain, so that any strong sibulance will get up to 12 dB more compression than other audio frequencies (though not enough to make people sound like they've got a lisp, in my tests). This, then, goes to a RMS circuit, so the compressor works on an average of the audio signal level, rather than the peaks. The side-chain output socket is always a buffered output of the main input signal. It's there to allow you do external processing of what would be the internal side-chain audio, such as run it through an equaliser. This RMS signal goes to the expander/gate control stage—where you have a threshold control, an expander or gate mode switch (which can be considered to act as a rather severe ratio preset switch), and a fast or slow release time switch—which develops a control signal to be sent to the voltage controlled amplifer (that is the processor that actually does the compressing). This gives you two kinds of auto-muting of low-level signals, with either hard turn-on/off (gating), or a softer turn-on/off (expander). It's a bit too severe to expand the dynamics of a signal (as in the opposite of compression), it really is just two kinds of muting. The same expander/gate control signal is, also, passed to the enhancer, I'm guessing as a mute control for the enhancer, since I've not exhaustively studied that part of the circuit. And what does the enhancer do? It mixes a preset amount of the uncompressed input audio into the output pre-amp for the processor, through a high pass filter. So a some extra treble gets through partially uncompressed. And it has a tie-in with the expander/gate circuitry (but I found any such effect to be unnoticeable, so I presume that the expander/gate tie-in is an enhancer-muting signal, rather than working in the other direction, as an enhancement of the expander/gate). The RMS signal also goes to the compressor control stage (where you have controls for attack and release times, and compression ratio), which develops a control signal to be sent to the voltage controlled amplifer (the same one as mentioned above). The “interactive knee” control switches-in a diode between the level comparator circuitry and the ratio control, adding a signal-level non-linearity to the onset of compression. I'm more than a bit annoyed to discover lies in the brochure, particularly because this may have been part of the purchase decision (of this unit over another). Most specifically, it states that the “auto attack/release” time feature is based on the audio content. Yet, when I found a schematic for the compressor, it shows that there's nothing automatic about it, the switch just selects preset time periods (for both the attack and release times). I consider that to be highly deceptive. I don't mind a preset button, but call it that. There's nothing automatic about a preset level, and it certainly isn't a time period somehow based on the input audio content. The only part of the circuit that can be said to act in a manner dependent on the audio content will be the RMS circuitry. But that's because RMS average of any audio signal is influenced on signal level and the pattern of the audio (e.g. continuous sounds versus sporadic impulses). 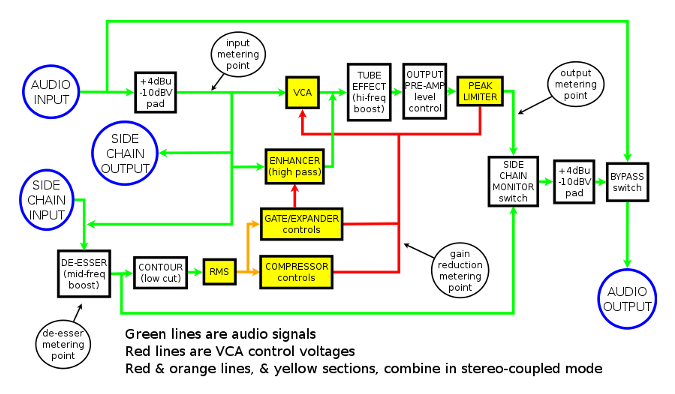 But this is only a signal-level effect, not a timing issue, as alluded to in the manual, where it talks about content-dependent automatic controls in the gate/expander and compressor (features that don't actually exist in the circuitry). Those of us who've read the manual know that the “tube” button introduces some kind of tube-emulating effect, that doesn't actually involve the use of a vacuum tube electron valve. But how does it work? Is it some complex circuitry to emulate the phonics of a valve? Is it something to add a bit of harmonic distortion? No, it's quite a simple circuit that adds a tiny bit of treble emphasis going to the output pre-amplifier (more treble in the output, of around 4 dB, starting around 2 kHz, reaching it around 6 kHz). It is merely a small capacitor placed across a resistor, in a voltage divider. Something that I consider to be quite a bit of cheek, and quite pointless (just adjust your mixer's eq controls to get the sound that you want). The limiter has a couple of diodes across the output signal (within the pre-amp stage), providing some very hard limiting. It also sends a control signal to the voltage controlled amplifier (the same one mentioned above), for some softer limiting (by controlling the compressor, as well). Considering how its limiting sounds, it's doing soft limiting before any hard limiting occurs (amplitude-wise), though there is a small RC time-constant delay leading to the soft limiting circuitry (so it's acting after the hard-limiting, time-wise). When the coupling button is pressed, several things happen. The two side-chain RMS output circuits are joined together, so both side-chain input signals are used together to produce a common side-chain control signal (though if one side-chain is louder than the other, it's going to be the only signal controlling the compressor). The VCA inputs are joined, so both outputs get the same compression. The, now, common RMS signal uses the left channel expander/gate and compressor controls to control both channels simultaneously. Likewise, each channel's limiter-monitor outputs are combined, to control both channels simultaneously (if either channel gets too strong), and using the left channel's control pot to set a common threshold level. The enhancer control input for the second channel is switched over to the left channel control switch. And what remains separate when the coupling button is pressed? The side-chain input selector and monitor switches remain independent. The low-contour and de-esser controls on each side-chain input remain independent. The tube-emulator output modifier switches remain independent. The metering, monitoring, and bypass switches all remain independent. At this stage, I haven't measured those frequencies, just made a by-ear comparison against a presettable tone generator. But signal strength observations were made using built-in and/or external decibel meters. Having spent a week or so putting various test signals through the compressor, live from microphones, guitars, pre-recorded audio, the audio quality is quite nice—I have no other compressor to do an A/B comparison, but a bypass/on-line comparison doesn't show up any obvious unpleasantness, and it sounds better than some of the limiters built into equipment that I've used over the years). You have to set controls at extremes to come up with any awful compressor effects. While playing an electric and accoustic guitar through it, you couldn't use it as much of an effect device (even with extreme settings), it just doesn't make much of its own sound, but that's not what I bought it for. And I don't have any recordings with an isolated vocal track to test with. Having said that, I didn't think too much of the expander/noise-gate. The noise-gate is just too extreme in operation to not notice it opening and closing, unless it was buried in the mix. In the expander mode, the changeover between pass-through, and expanded-to-near-nothing, is far less noticeable, but you have no control of the ratio, nor the attack time, and only a fast/slow release time switch. It just sounds weird having speech go through it, with the extremes between silent and audio passed through it. I did try putting a guitar through it, but you get the same deafness feel to dead muted audio. I think that you definitely need to mix in some ambient noise, over the top, to mask that dead/live sound changeover. I finally had an actual production to try it with, and it did the job rather nicely: Recording a small church service being led by several different people, none speaking particularly loudly, nor at consistent levels, with a singing congregation that was significantly louder than the speaking parts of the service, using just a stereo microphone pair set up at the front of the church, set up independently from their own sound system. The event was recorded uncompressed, with a consistent recording level set up so that loud singing was at the nominal signal level. The dub of the recording was made by playing the audio through the compressor, with the limiter set to clamp down on anything about 14 dB above normal, just in case (but nothing did go that high), and the compression threshold and ratio set to keep the group singing just a bit louder than the speech or solo singing (just a small amount of compression), and leaving the attack and release times set on automatic. Normally, for these sorts of events, I'd have to ride the levels up and down throughout the entire program, probably by around 6–8 dB, and inevitably get it wrong, at some stage. And, perhaps having to contend with the nasty sound caused by clipping should someone knock something over, or sneeze, near a microphone. But all I had to do was play a bit of the loud part of the recording, and a bit of the quieter parts, to test out my levels while playing with a couple of knobs for a few minutes (threshold and ratio) to get a pleasing balance of sound between the louder and quieter parts, and I could let it manage the audio levels for the whole program, for me. Somewhere around 3:1 compression, with a soft knee, and the threshold set to just begin to kick in when someone spoke a bit loudly. Other than manually riding the levels, the alternatives are using AGC (which has too much range between low and high gain, with annoying, and unadjustable, attack and release times), using a hard limiter (which can make horrible pumping effects on intermittent/fast loud peaks), or having a recording with too much dynamic range for the way this sort of program would have been listened to (moderately quietly, most likely). It did the job well, and without being really noticeable that audio levels were being changed, and that is what I wanted. The ¼” TRS jacks have been highly unreliable, repeatedly requiring scraping the plug in and out to get a signal from the unit. This would be hard to do when buried in a rack. It needs better sockets, and I'd recommend people use the XLR connectors, instead, even if coupling unbalanced signals. It has been seriously annoying that the switch for the input/output level meter is backwards (you have to push it in to monitor the output, and you release it out to monitor the input). This is a very counter-intuitive interface design that is forever catching me out. Either the the switch should only be labelled for what it does when pressed in (output monitor), or it should be set up to work logically (press it in to monitor the input, and pop it out to monitor the output). I have considered modifying the circuit, but it's too tiny and awkward to get into, and the board is glued into position, as well as being held by all the control knobs. The same can be said for the expander/gate “release” switch—which just says “release,” with no clue whether pressing it in is for “fast” or “slow” release—it needs sensible labelling. Fortunately, I don't really make use of the expander or gate, so this function was largely ignored. The behaviour in linked mode (stereo) is confusing. When in linked mode, you expect all the controls on one side to affect both sides, simultaneously. And for the most part, they do, but there's a few oddities that take you by surprise: The de-esser isn't linked, neither is the tube-sound-faker. I can't really imagine why you'd want them to still be independent when in linked mode. About the only control I'd expect to remain independent is the output level control, so you can balance out both outputs to the same level. Though, on the other hand, it'd be nice if one control did both outputs at the same time, to easily adjust the make-up gain across both channels at the same time, and that you didn't need to trim one side of the output to match the other, but could do so if you had to (e.g. the left “master” control adjusted the gain of both channels, and the right control let you adjust out any inconsistencies with the right channel level). And it'd be nice that if you pressed, say the “auto” button on the left channel, while the left channel is controlling the left and right outputs (in linked mode), that the indicator light for that function lit up on both channels, at the same time, just to show that the same functions were operating on both channels, simultaneously. Likewise for other linked functions, but they don't. The main output audio sounds good, and if you turn off the effects processing (expanding, compressing, and limiting), there's no significant audio quality difference between bypass or through (and the “bypass” is a true, relay-switched, bypass of the entire internal audio path, which also kicks-in if the power is removed). And when you do use the expander, compressor, or limiter, there doesn't seem to be any audio quality degradations, just the expected signal level changes. The side channel output, on the other hand, has that nasty sound of the early transistor audio equipment that all the valve enthusiasts hated (the side channel output being an op-amp buffered signal of the main input, so you can do some outboard processing, then send it back into the side channel control input). Not that you'd, usually, want to listen to it, but it may have some bearing if you're daisy chaining equipment for special effects. The cause of that has to be the op-amp output circuitry not being a good line-driver, as the same signal passes internally without sounding so awful. More headroom would be appreciated, it clips too easily, close to the input stages, before the compression or limiting stages. There's two main uses for compressor/limiting equipment; controlling the strength of signals to a more normalised level, and for preventing loud excursions from being super loud and clipping the audio signal. 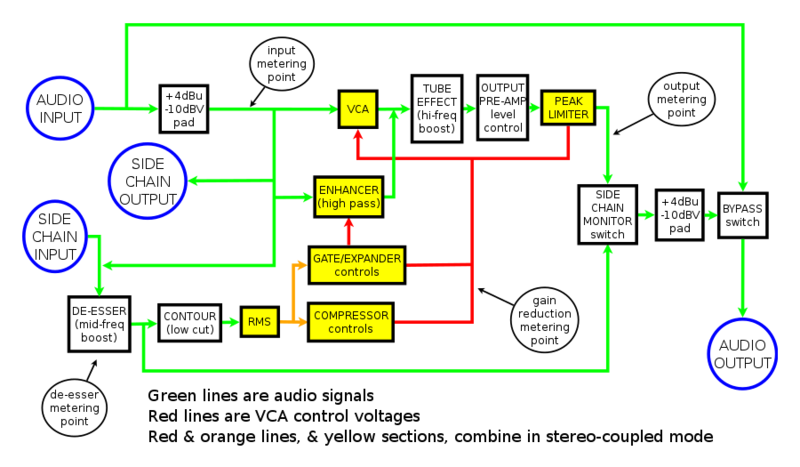 For the latter, you really need the compressor to be good at handling strong input signals without distortion. If you can imagine a rock singer talking to an audience through a mike, then launching into a song at full belt, that can be more than a 20 dB change in level, and those are the kind of differences that you want a compressor/limiter to regulate. The unit runs mostly cool, with the exception of the side where the power supply transformer is mounted—that gets quite hot. The manual doesn't say much about cooling, other than saying be sure there is enough air space around it, and do not place it on things like power amps. Conventional wisdom is that you should space-apart your rack-mounted equipment. Though that may be inconvenient, or next to impossible in some cases (pun intended). I would be prepared to stack units like these directly together, so long as there was good air flow on the hot side of the box (fans in cabinets are a good idea). Opening up the unit, it is only the power transformer that gets (very) hot, the rest of the circuitry runs cold. That suggests that, either the transformer is underated for the job, or is just badly made. Some of these complaints (switch labelling, and stereo-coupling modes) are cosmetic, and could be easily fixed, if a bit more thought went into the product. But some of my critiques are far more judgemental. I'm not impressed by lies about automatic features that are really presets with no automatic functions behind them (such as attack and release times for the gate/expander and compressor, or the voice-adaptive de-esser, which are allegedly automatically adjusted dependent on the content of the sound, but are not). Or alleged electron vacuum tube simulation, that's really just a slight mid-high frequency boost. They're just plain deceptive marketing. Written by Tim Seifert on 5 Dec 2013, and last updated on 27 Jun 2016.